This topic contains 6 replies, has 2 voices, and was last updated by Za Kene 5 years, 2 months ago. How to change background color in theme? which files to edit? To find which HTML element to change use “Element Inspector” on Google Chrome. 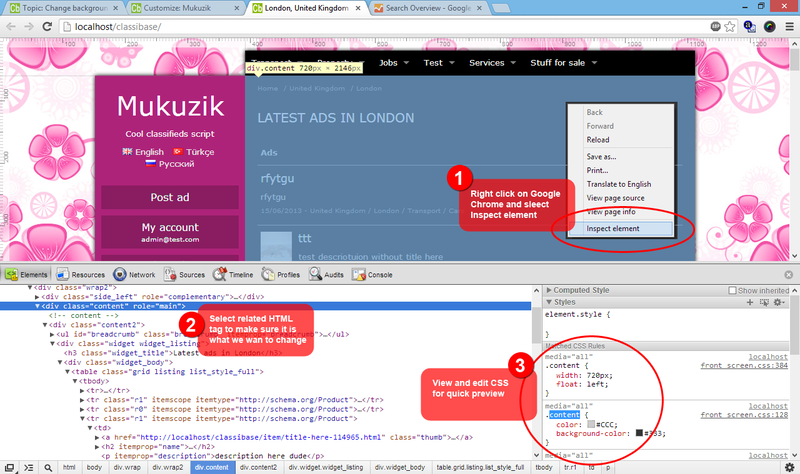 Right click on element you want to add custom CSS and click on “Inspect Element” context menu. From opened elemen ispector select html element and related CSS styles will be displayed on right. I use a Mukuzik theme. But I find it difficult to change the background color. I want to set the background to white (# ffffff), and the text color to black (#000000) in the ad content. Can you help me give php code that I want the settings, if you do not mind please include also screen shoot. Ok, Paste following code to “Custom Styles” field displayed in above image. This will make your background white and text black. You may need to tweak code further. I use a mukuzik theme, with the main color #a60c69, and text color #000000. How do I change the font color on the icons featured, but still retains the black color in the main text. In the featured icons, I want to change the font to white. Which values ​​should be changed? !important is used because background for featured icon is set by main color later in the code. !important prevent any other setting to overwrite here defined background-color value. Is Classifieds Base theme can also change the color? What values ​​should be changed?